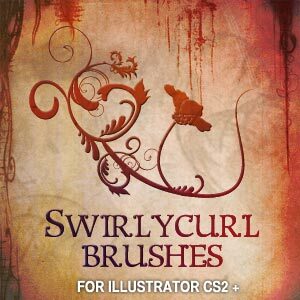 No matter how many I have, I just can’t get enough swirly curly leafy brushes in my ever expanding brush palette. A steady supply helps keep me inspired and exited when starting on new projects, particularly cd cover design backgrounds. There are plenty of good free Illustrator brushes out there, and here are some new ones recently discovered at CreateSk8. They are for Adobe Illustrator CS2 or better. Put the file in Adobe Illustrator CS2>Presets>Brushes. Then select “Open Brush Library” from the Illustrator brushes panel menu. Then make something cool! Nice Post, these dingbat brushes will come in handy for adding a hint of class and sophistication to my designs. Thanks. Can we use these brushes for InDesign? When downloading these brushes would I just save them like I was downloading a new font but in the Illustrator Brush folder? K, I’ve downloaded it and put it into the brushes folder but it won’t incorporate. How do I get it to work? I can double click on it and it will open one illustrator file with the brushes but that file won’t save correctly and is therefore not usable. Navigate to the file and it will load the brushes into a panel for selecting. Happy designing! Do you have a copy of this file it seems like it has been removed from the website? I really need it. Just perfect for the poster I’m working on. Thanks for sharing your talent! !